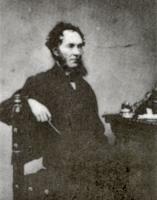 John Edward Burghall Wall Du Val was born on 3 January 1805 at Beaumaris in Anglesey, North Wales, and baptised there on 6 January 1805. He was the son of Edward Octavius Caesar Wall Du Val and his wife née Sarah Eskildson. Although not so successful as his brother Charles Allen Du Val he had a more lasting career than had his brother George William Wall Du Val. But his star, although rising brilliantly, in the end sank into obscurity. He studied languages at Trinity College in Dublin, graduating at the early age of seventeen and afterwards carrying out postgraduate work at Cambridge (1). In 1825 Elizabeth Jackson, "a wealthy and respected trader" had signed a deed conveying the business of her toy merchant firm in Grafton Street in Dublin to her two daughters, one of whom was Mary Jackson, the first wife of John Edward Burghall Wall Du Val (2). But by 1838 Mary Du Val had died, and the property had passed to their infant child. In June 1838 a Dublin newspaper reported that the petition of John Edward Duval, an insolvent toy merchant of Grafton Street was to be heard on 18 July following (3). The case was duly heard and reported on 27 July 1838. The petition was opposed on behalf of English merchants who had sold him goods. He had no money, and was trading "under that well-known firm of Jackson and Co." He had run up debts of £1,000 and yet had spent £200 on medicine and £140 on lawyer's fees, although he did not own "as much as a penny whistle". When the creditor came to collect his money he found Du Val lodged in St Stephen's prison on quite another suit. The defence lawyer argued that Du Val had been cruelly wronged and that "no man ever came into that court with an honester case, nor had any man been more cruelly persecuted". He had been cast into prison in 1837, "entered into a compromise with his creditors", and released. Since then he had paid them £800, which was more than agreed in the compromise. He was continuing to repay, although "in a dangerous state of health", when he had been re-arrested and put back in prison. The case had to be adjourned because the deed conveying the toy merchant business could not be produced. Time was needed to bring it into court (4). The court resumed on the following Saturday, but the deed had not arrived from Cork, and the case was again postponed (5). On 7 August 1838 the case resumed, but there were fresh difficulties in that Du Val had not produced necessary receipts. It was argued that ill health was endangering his life, and argument then ensued about the ability of the apothecary who had said so. The Commissioner was understandably getting fed up with all the delay, and pointed out that Du Val owed only £9, and if his friends paid that debt for him, he could be freed within the hour. The case was again adjourned (6). On 5 October 1838 the case was resumed but the defendant was not in court. He had been released when his debt had been paid on his behalf. Nevertheless the petition was still opposed, and the case adjourned yet again (7). Nothing more of the matter appears to have reported. Nor is it known what happened to the child by Mary Jackson who inherited the Grafton Street business of Jackson and Co.
John Edward Du Val married as his second wife Eliza Ann Murray (8). She came from County Wicklow in Ireland, and they lived for a while in Dublin. Two daughters, were born there. The elder girl (born in 1835) was named Eliza Ann, but called Lily to distinguish her from her mother. The younger girl (born 1844) was named Anna Selina, but called Nan by her family (9). By 1845 the family had moved to Manchester. In 1846 John Duval opened a school “for the sons of gentlemen” in Park View, a large house on Turnpike (now Wilmslow) Road in Rusholme, not far from where his brother Charles Allen Du Val had settled at Green Heyes in the suburb of Chorlton-on-Medlock. John Du Val and his family lived on the opposite side of Wilmslow Road in Platt Terrace from the school, in the northern of two semi-detached villas facing across to Platt Hall and its extensive grounds. This was then a desirable district. The Platt Terrace house had a large garden, screened by trees. At the rear, lawns and flower borders led down to an orchard. Next door was a bowling green and, on the corner of Dickenson Road, stood the Birch Villa Inn (10). At Platt Terrace a son was born on 27 October 1846, and baptised Charles Henry in Manchester Cathedral on 29 January 1847. He was called Charley in the family. The family were close knit and affectionate, hard-working and extrovert. They were also highly gifted artistically and fond of amateur dramatics. The house was full of music, and Charley learned to play the violin. He was the centre of attention in the family, and adored by them. Charley grew into a handsome young man, amiable and good-natured. Soon he was acting in amateur productions in Manchester, and clearly destined for a brilliant career on the stage (11). However his father’s business was less promising of success. Although cultured and diligent, and a first-class linguist, sadly John Du Val had no head at all for business. He gave private lessons six days a week, both at the school and at 74 George Street which was the business address of his brother Charles Allen Du Val. His school ought to have been a great success, situated as it was in a prosperous middle-class suburb of Manchester, but it soon failed. John Du Val had bought his home, and the house next door, on mortgages. He was in arrears for rates already by 1847 and in the next year he had to sell both houses and move to a smaller place in Monmouth Street, just behind his former school. Over the next fifteen years the family had to move five times in the same area, finishing up at 16 Gore Street, Oxford Road. For the rest of his life poor John Du Val taught as a “Professor of Languages” at his brother’s city centre premises. He just managed to survive financially, but had to live in reduced circumstances (12). When the 1871 Census was taken he was living aged 66 at 63 Ducie Grove, Chorlton-on-Medlock in Manchester, described as a "Teacher of Languages". With him in the household were his wife Eliza aged 63 and daughter Lily aged 27, together with a female servant and two lodgers. John Du Val wrote and published much poetry. Aged only fifteen, but already an undergraduate at Trinity College, he wrote and published an ode addressed to king George IV on the occasion of the royal visit to Ireland in 1821. He followed this with “The Battle of Navarino”, and in 1826 by “The Patriot’s Love and Other Poems”. Navarino was a sea battle fought during the Greek War of Independence, a cause that deeply concerned Lord Byron, and for which he ultimately gave his life. John Du Val was greatly influenced by Byron, and dedicated a poem to him. He also published verse translations from Latin, Greek, French, German and Italian poetry (13). The reflex of thy intellectual mind. (1) Du Val Tonight! : The Story of a Showman by Vivien Allen (1990) pages 2 and 3. Information on the early career and family life of John Edward Burghall Wall Du Val is summarised by Vivien Allen in her delightful book, based on extensive research carried out in, among other places, the collections in the Library of the Manx Museum and Douglas Public Library in the Isle of Man, and on information generously given by descendants of Anna Selina Foot nee Du Val. (2) They appear to have married in 1831. They were granted a marriage licence in that year (Deputy Keeper's Thirtieth Report : Dublin Will and Grant Book Index 1270-1858 : Index to the Act or Grant Books and Original Wills page 314). (3) Freeman's Journal and Daily Commercial Advertiser 27 June 1838. (4) Freeman's Journal and Daily Commercial Advertiser 27 July 1838. (5) Freeman’s Journal and Daily Commercial Advertiser 30 July 1838. (6) Freeman’s Journal and Daily Commercial Advertiser 7 August 1838. (7) Freeman’s Journal and Daily Commercial Advertiser 5 October 1838. (8) They appear to have married in 1836. They were granted a marriage licence in that year (Deputy Keeper's Thirtieth Report : Dublin Will and Grant Book Index 1270-1858 : Index to the Act or Grant Books and Original Wills page 314). The intended bride was named there as Eliza Anne Murray. (9) Du Val Tonight! page 2. (10) Du Val Tonight! page 1. Although the public house is still there, Platt Terrace survived only until 1970, by when it had been converted into offices and a petrol station. (11) Du Val Tonight! pages 1, 4 and 7. (12) Du Val Tonight! page 5. (13) Du Val Tonight! pages 5 and 6. (14) Du Val Tonight! page 31.